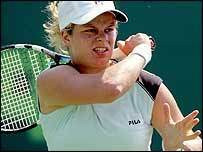 Kim Clijsters extended her winning streak to 16 matches with a straight sets victory over Maria Kirilenko in the J&S Cup second round in Warsaw. The in-form Belgian booked her place in the quarter-finals of the WTA event by sweeping the Russian aside 6-2 6-1. Elsewhere Russian second seed Svetlana Kuznetsova took three sets to see off Israel's Anna Smashnova 6-2 4-6 6-0. Fifth seed Elena Bovina took three sets to beat Daniela Hantuchova while Silvia Farina Elia also progressed.